Sensitivity V Backpack is the perfect personal daypack that can be used to carry and protect a 12" Laptop and Digicam or SLR + MP3/MP4 player + PDA + Phone and accessories. Two front U shaped flaps access top and bottom compartments separately and each functions as a flexible pocket. 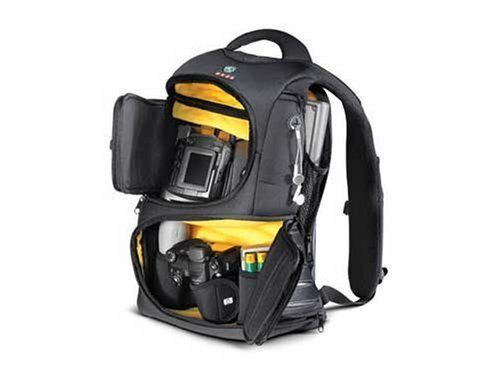 The main compartment is divided in two with a zippered division that can be undone to create one large space, and the ample internal and external pockets will store all your personal gear in addition to your photographic equipment. I received my Kata Ergo-Tech Series Sensitivity V pack today and decided to see exactly how much I could fit into it. I was concerned that I may have to leave a lens behind on an upcoming trip as others were only able to fit 2 lenses and a camera with an attached lens. I still have 4 pockets yet unused (1 each on the zipper sideways "u" shaped flaps) 1 on the strap and one on the side. I could also fit a magazine or paperback in with my laptop. It seemed heavy at first but on the back it feels fine. We'll see how it goes after hauling it all over the islands. My one minor complaint is the white logos showing you where things go (picture of a laptop, cell phone, Ipod). I'll be blacking that out with a sharpie as I don't care to advertise that I'm carrying those items. Also, for more security we'll be placing keyring loops on each of the zipper pulls so I can lock them together with a small padlock (since there are dual zippers on the top and bottom section). The best camera/laptop bag around. Period. After spending many hours researching camera bags online and in camera stores, I chose to purchase the 'Kata Sensitivity V' camera bag. I currently own a 15inch MacBook Pro and a Dell Mini 9 NetBook, so I wanted something I could carry my camera gear in, along with one of my laptops. The first impressions of the bag are spectacular. It has ample room for my D300, a 50mm lens, 10-20mm lens, 70-200 lens, hot-shoe mount flash, CF cards, cleaning rags, a snack, AND my NetBook laptop. It really does work well. I'm totally impressed and constantly get comments about its great looks. Despite what another review of this bag states, I could never get the zippers of the laptop compartment to fit around my 15in MacBook Pro. Nor would I want to force them. I don't want to break them, or mangle them in some way. So I would recommend 13-14in laptops are the max. The compartment is also roomy enough to hold a magazine or book if needed also. This bag does not give you 'instant' access to you gear, as you might expectdue to the zippered compartments. (Velcro will always be faster.) But overall its quick enough. The zippers and construction seem to be of the highest quality, and I would expect this bag to last for years. I use this bag primarily for longer trips, opting for my sling-type bag for around the town walking, etc. Very good but could be improved. I purchased this Kata Bag after reading reviews here on Amazon and I love it. I was a little concerned about whether the material would be too hot on my back, but I used it on a two-hour hike in the Blue Ridge Mountains with no problem. Fits my back perfectly and makes my camera gear easy to carry, even when using hiking poles. I carried my Nikon D80 with 18-200mm lens attached, along with an extra wide-angle lens. My HP 14-inch widescreen laptop fits in the computer pocket. I recently went to the Pacific Northwest for vacation, and tugged along my Canon Digital EOS Digital Rebel XT, 18-55mm lens, Tamron 11-18mm lens, and Canon 400mm lens. I put the large 400mm lens in the top section, the camera body and two others in the bottom section. Inside the top section is a small zippered pouch where you can put small items, such as a lens cloth, brush, etc. I had a large lens stored there which took up 95% of the space, but if you don't have such a big lens, you can use that area to store an external flash, and a few smaller lens. The laptop section is rather small, so you can only fit a 13" sized laptop or smaller. For my trip, I just used it to hold small pamplets. The external pouches are rather small and for my purposes, not very useful. They are very tight, so they can't really hold anything large. They can't even hold lens filters very well. I put a stock Hoya plastic lens case in the side pouch, and one of the sharp corners of the lens case actually left a mark on the bag. If I had left it longer, it probably would've punched a hole through. The material is very soft to the touch, and can withstand light rain. However, I wouldn't take this bag out in a thunderstorm, as it is not waterproof. The bag is very stylish, and quite comfortable even lugging all my camera gear for hours. It does get a little hot in the back, as there is no ventilation. I recently purchased this bag to become my day-to-day backpack, so that I could carry laptop and DSLR confortably and securely. It fits amazingly on the bag, very secure and confortable. I walk a lot with it and I don't even feel it's there! There's tons of space and the divisions are wonderful, you can put anything you want in there, because everything is pretty much customizable. The only thing I wish they'd rethink are the shoulder straps. They're too wide to allow me to cross my arms, for example (something I do a lot while waiting on traffic lights). They're also very rigid, so it's very difficult to put any kind of mobile or mp3 player on these pockets and retrieve it quickly -- I broke a fingernail trying to remove my mobile from it. This bag has all the room I need for packing light. It will hold my xTI body and a couple of extra lenses. The "top" portion of the bag has space for memory cards/sticks, which is nice. I really enjoy the bright yellow interior, it helps you acquire items quickly. The camera stays snug with the velcro / elastic strapping system. There is plenty of extra room in the top compartment and in the laptop compartment for some papers, magazines, or a thin book. As you can see this bag can hold a lot of stuff and it's still really small. The bag completely full is about the size of the Lowepro SlingShot 200 AW. It also conforms perfectly to the back. I think I've found the perfect bag. I do expect that as I use it more I'll find that it will make my back a little sweaty as the material doesn't look like it breathes very well. I also expect to need one of my bigger bags for an extended trip or when I need to carry more lenses. Other than that, no problem. Oh and it looks really sweet! I spent quite awhile searching through a variety of reviews on bags that I could use that would be versatile enough for my day-to-day life. I am a full-time IT professional and a part-time student. I wanted a bag that I could always carry my MacBook (13" screen) comfortably, while exchanging the content in the front compartments. The internal compartment is great for storing the Nikon D50, 2 spare lenses, and all the cords and connectors that go with the Mac and the Camera. I can also pull out all the camera gear and cart around a notebook, small textbook and dictionary.